Kinda hard to see in this light,...but the over all piece also worked as a pretty good add! The guy that runs the show at Signal is named Kioske, and goes by the nic in the racing industry as "Mad K", or K-Daddy. 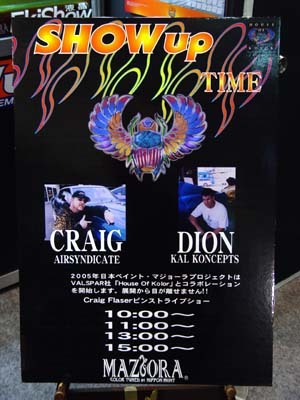 He has been involved in kustomizing, time trials, slolom, and Drift for the past 25 years in Japan. 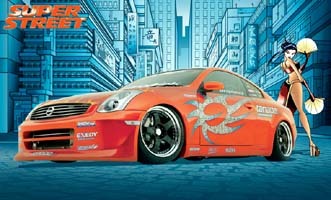 With his newest tuner outlet in Torrence Calif, he is not only the original, but also the newest K-Daddy to hit the West Coast! 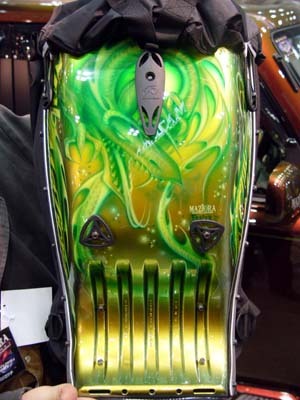 One of the Fiberglass back packs that I did for Maziora for the show. These things are killer to paint on,...Good way to accessorize yourself to match your motorcycle, or whatever your ride!! 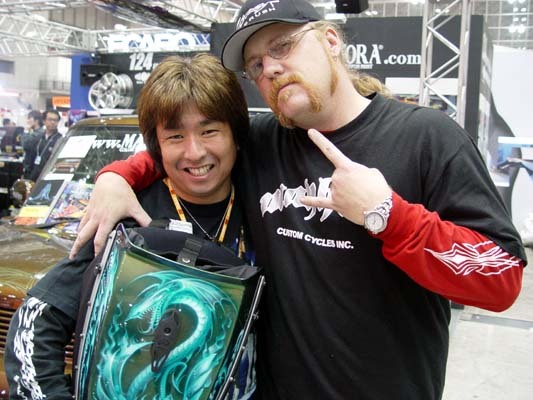 Keiji, and Craig with another backpach that Craig painted up with the familiar Maziora Dragon logo. 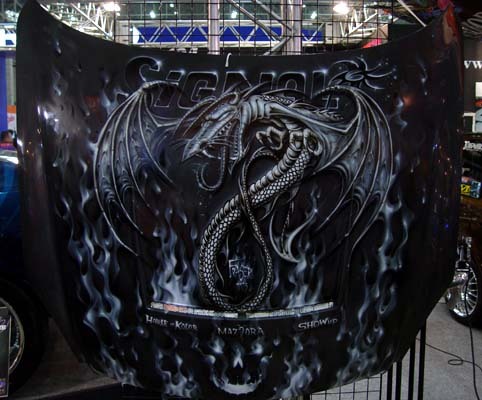 Dragons,...and skulls,...now that is the kind of corporate identity that a kustom painter can get used to! Craig Fraser, (Me) with the whole gang. What's the hand-sign mean,....Heck if I know,...they use it alot,...maybe they all overdosed on Monster Garage,...or they are a bunch of Dio fans!